We have a responsibility to protect our farmland, this most valuable resource, for future generations. Yes, you really can make a difference. I would like to take this opportunity to share my opinion of the proposed Conejo Creek development with you. The thought of 2500 rooftops replacing the strawberry fields as the gateway to Ventura County at the base of the Conejo Grade and sharing the freeway with 40,000 more cars every… single…. day…. brings tears to my eyes. I hope your vote will reflect the opinion of our community. Our website is chock full of information you can use and the Impact Summary under the Conejo Creek tab is a good place to look for ideas. 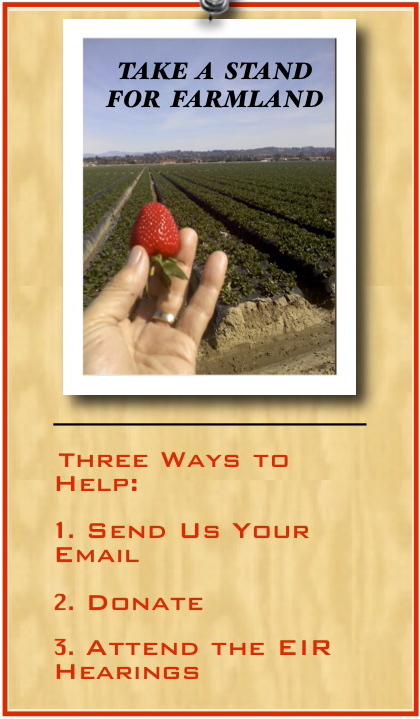 Notes: (1) If you have the credentials to qualify as an expert in any of the areas addressed in the DEIR and are willing to comment as an expert, please contact us at camarillosustainablegrowth@gmail.com. We NEED your help. The DEIR is available on the City’s website as well as this one. The upside to the city’s version is that you can get directly to a paragraph by clicking on a section in the Table of Contents. The downside is that it is 66MB in size. The copy on this site is broken down into much smaller pieces. You can still search from within a document by using your computers search function. 2. YOU CAN HELP BY SUBSCRIBING to our mailing list (top right corner) so that we can keep you informed of important developments, hearings, and meetings. We are a 501(c)3 nonprofit grassroots organization, so we need to conserve our limited resources. The most cost effective way to stay in touch is through email and our website. Make sure you have subscribed to our mailing list (top right corner) to receive all of our important updates as they develop. Your email will never be released and we are judicious in the number of emails we send out. Be sure and add us to your contacts so we do not end up in your spam folder. 3. YOU CAN HELP BY MAKING A TAX-DEDUCTIBLE CONRIBUTION to help defray our costs. We have hired the Environmental Defense Center to help represent us during the Environmental Impact Report (EIR) hearings. We are a 501(c)3 nonprofit organization, and therefore we depend upon our generous supporters for our funding. To make a secure donation with PayPal, or to send a check by mail, please go to our donation page. 4. YOU CAN HELP IS BY ATTENDING THE EIR HEARINGS AND SHOWING YOUR SUPPORT. It is essential that we let the City Council know how important this is to so many people. We must show a strong united front to save our farmland. If you don’t do anything else, please make sure you do this. It is the most important thing that you can do. We will send you an email as soon as we know the specific dates. If you’re not already signed up to receive our e-newsletter and updates, please take a moment to subscribe to our mailing list (top right corner) to receive the latest information. Make sure you add us to your address book so we don’t end up in your spam folder. 5. YOU CAN HELP BY VOLUNTEERING. We need your help. To see what you can do to become part of the solution click here for more information on how to become a volunteer.